1 Season chicken, if desired, with salt and pepper. Melt Spread in large nonstick skillet over medium-high heat and cook chicken until chicken is thoroughly cooked. Remove and set aside. 2 Stir in onion and celery and cook 4 minutes or until tender. 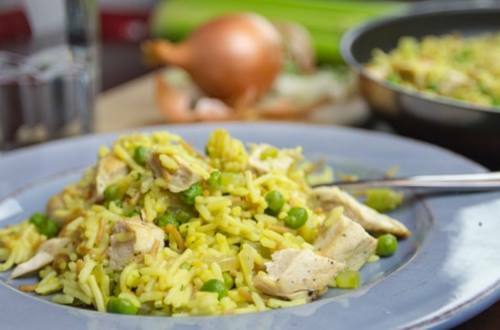 Stir in water, peas and Knorr® Rice Sides™ - Chicken flavor and bring to a boil over medium heat. Continue boiling over medium heat, stirring occasionally, 10 minutes or until rice is tender. Stir in chicken; heat through.